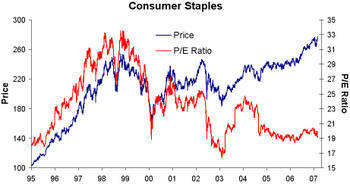 Below we highlight Consumer Staples, Consumer Discretionary and Energy as the next three sectors in our Historical Sector P/E Charts series. 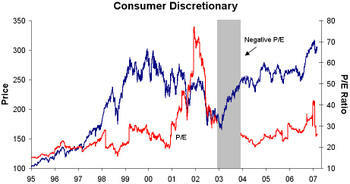 The P/E of the Consumer Discretionary sector took a dip in recent weeks as prices came in slightly and earnings remained strong. 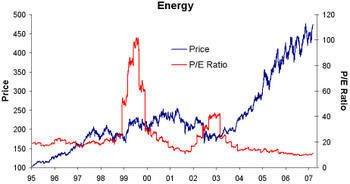 The Energy chart clearly shows the earnings strength of the sector. The price performance of the sector has risen sharply over the past few years, but the P/E has contracted, indicating earnings have outpaced the price rise.